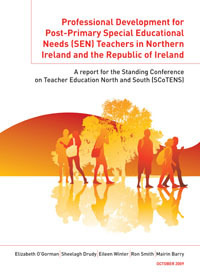 The purpose of this project is to investigate the professional development needs of those second level (post primary) teachers who have a specific remit to work with students who have special educational needs (SEN) in mainstream school settings. Ms Elizabeth O’Gorman, Professor Sheelagh Drudy & Ms Mairin Barry, University College Dublin. Dr Eileen Winter, Institute of Child Education and Psychology Europe (ICEPE) and Dr Ron Smith, Queen’s University Belfast.